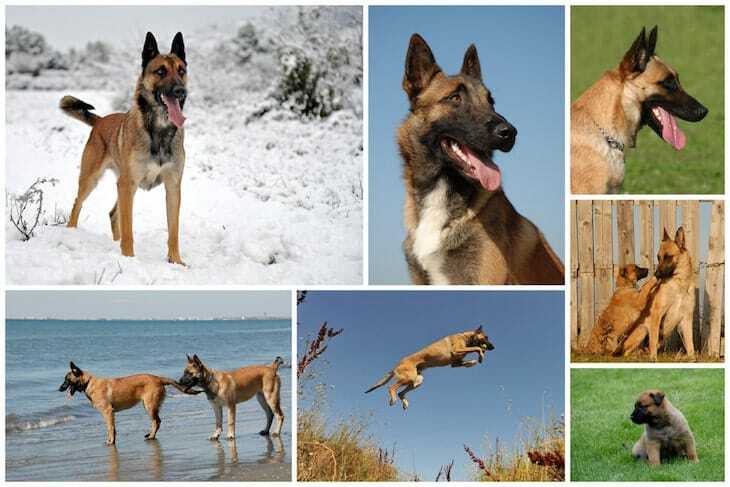 The Belgian Malinois temperament is active and friendly, as well as, intelligent, protective, and alert. They’re also not afraid of hard labor. Interestingly, the energy level of a Malinois is one of the most intense of all of the dog breeds. Your average Malinois will still act like a puppy right up until he’s three years old. Although some can carry on that level of exhausting energy for another two years. As you may guess, these dogs are quite popular in Belgium but they remain rare in other parts of the world. As a matter of fact, their name is derived from the Belgium town of Malines. They are usually trained as guard dogs and they are also trained as police dogs. They are occasionally seen competing in dog shows and you will also find them competing in dog sports. In a nutshell, the Belgian Malinois temperament is quite demanding and to handle this dog requires that you have some significant experience. Here are a few temperament and behavioral traits to watch out for if you are considering bringing home a Belgian Malinois. The first is that this Belgian shepherd dog is both intelligent and obedient. Because of this, it is easy to train and it learns fast. In fact, the Malinois is one of the most popular breeds used in what is referred to as “protection sports”. 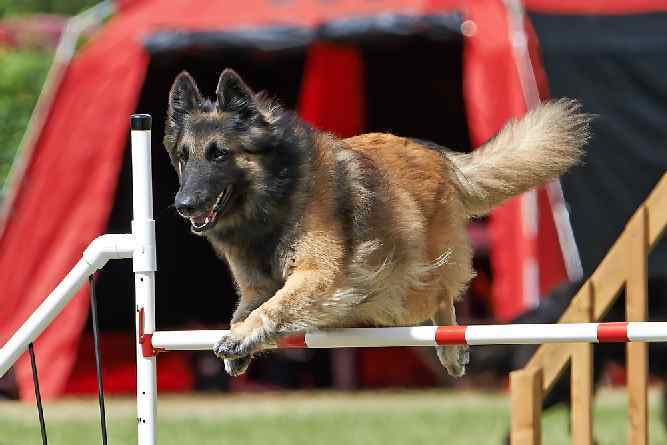 For example, the Schutzhund, which is a demanding test originally developed for the German Shepherd. It determines whether or not the dog is suitable to be a proper working dog. Like most guard dogs, they are very observant and can sense strangers from a distance. They are very protective of their owners and also very loyal. They can be left to wander free but they will always track the scent of their owner and go back home. Another aspect of the Belgian Malinois temperament is that they can be very good with children if they are sufficiently socialized. If not, they can be irritable, a little aggressive and hard to handle. Your dog will not do very well if you keep it locked up in a kennel. It needs to be out there with the family. It understands and appreciates company. They can nip at heels and this needs to be discouraged through good socialization. 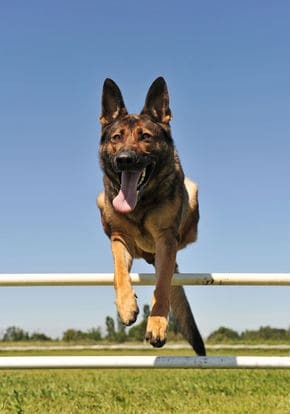 When it comes to other dogs, the Belgian Malinois tends to want to dominate, a behavior which should not be encouraged. They also tend to prey on small non-canine mammals and this should be discouraged as well. The Malinois also has what is considered to be an excessively high prey drive (the instinct to find and capture prey). Belgian Malinois can become shy and sensitive if not socialized properly and this would effectively make them useless as guard dogs. Although they need their owner to be very firm and assert his authority, they don't respond well to excessive discipline. If they sense that you are crossing the line they will simply lie down and become unresponsive. As the owner, you should be confident and you should show your dog that you are in charge. You also must also set down the rules and follow them consistently. Overall she should be easy to train, and she loves rewards. Consistency is key. It is recommended that you start to socialize your Belgian Malinois as puppies if you want to take advantage of their guarding instincts and get ahead of aggression. If you are getting an adult Belgian Malinois you should find out if they have been trained. The Online Dog Trainer by Doggy Dan a world-class Dog Trainer from New Zealand is worth taking a look at. This online resource has hundreds of fun informative dog training videos that can help you learn the basics and more to help you train your Belgian Malinois. As with many dog breeds, it is important to exercise your Malinois. If you don't she can develop behavioral problems. She has a lot of energy to burn off, and she needs your help in order to do it. They can do well as house dogs but they need some room to play. And while they can survive in a small backyard if you want to make the most of their energy, make the time to walk your dog every day. The Malinois is a breed that often gets lumped in with the Belgian Shepherd dog classification as opposed to being recognized as its own separate breed. Belgian Shepherds are considered medium to large-sized herding dogs. Other Belgian Shepherd dog types include the Groenendael, the Laekenois, and the Tervuren. The Belgian Malinois temperament makes them ideal for use as police dogs. They can detect explosives and arson-related odors, as well as narcotics. They have even been used in search-and-rescue missions. And to track down perpetrators that need to be apprehended by police. As was previously stated, the Malinois is on the medium to large side when it comes to dog breeds. She often has similar colorings to that of the German Shepherd (black and brown). Although her frame is of more of a square build than that of the German Shepherd. Because the Malinois was bred to be a working dog, functionality was preferred over form. Therefore, the appearance of a Malinois can vary greatly from one dog to the next. This is especially true amongst Belgian Shepherd dogs in general. Don’t let the size of a Malinois intimidate you – he’s anxious for your love and attention. The Belgian Malinois temperament dictates that he loves people and wants to be around them as much as possible. And speaking of her size, the Malinois typically measures in 22 to 24 inches at the withers for females. The males are usually 24 to 28 inches high. Females are said to be of an average weight at 55 to 66 lbs. While males usually run heavier at between 64 and 75 lbs. Like Huskies, the Malinois sheds his coat constantly. And also like huskies, you’ll notice that there are two periods throughout the year when he sheds the most. So be prepared to groom your Malinois regularly, and invest in a good vacuum cleaner! It is highly recommended that folks who may be interested in owning a Malinois get to know the breed first. Between their intelligence level, insatiably high energy, and other traits consistent with the Belgian Malinois temperament, Malinois are not a recommended breed for inexperienced dog owners. On average, a Belgian Malinois will live between 12 to 14 years (Life Expectancy). Although quite a hardy dog, it can be affected by the following problems. This painful condition happens when the thigh bone doesn't properly fit in the socket. It can affect one or both hips and in a dog that's in its prime, you may not notice it. In older dogs, however, you will notice that it is in pain and dogs that come down with it tend to develop arthritis later in life. This condition affects vision and fortunately, a simple test will tell you whether your dog is likely to develop it in the future. Dogs, like humans, can learn to live with the blindness caused by this disease quite happily but you should not move furniture around. This can lead to lameness. It is caused by different growth rates of the elbow bones. It can be corrected with surgery. The pain can be controlled using medication. There have been attempts to correct many of these ailments through selective breeding. Note: If you agree that your health and your dog's health should be a top priority then get a copy of The Ultimate Guide to Dog Health. Your Malinois friend will love you for it. This guide will help save you money, time and most of all help you keep your dog healthy. The best way to ensure that you are getting a healthy Malinois if you’re a first-time owner is to check the dog’s health clearances first. Health clearances indicate that the dog has been both tested for and cleared of conditions in particular. You should be able to obtain health clearances from the breeder or from whoever you are buying or adopting the dog. Some of the websites, like the one for the American Kennel Club, have databases that may aid your research before you bring the dog home. Health clearances that are specific to the Malinois include Hip dysplasia, Elbow dysplasia, and Hypothyroidism. These clearances should come from the OFA (Orthopedic Foundation for Animals). In addition, you’ll also need to see clearances for Thrombopathia, a type of Hemophilia, (from Auburn University). As well as eye health (from the CERF – Canine Eye Registry Foundation). Consistent training and exercise and the ability to keep up with such a high energy level are key to having a fulfilling relationship with your Belgian Malinois. 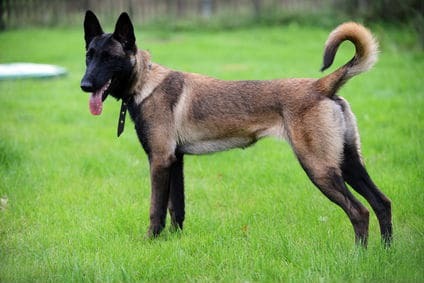 The Belgian Malinois temperament can be lots of fun, provided you are informed on the best possible ways to nurture it.